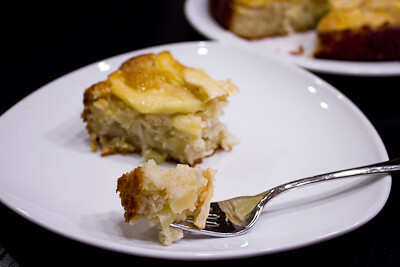 This week's Tuesdays with Dorie (TWD) recipe was chosen by Amber of Cobbler du Monde: Apple-Coconut Family Cake. I had seen this recipe in the book before, and thought it looked interesting. I honestly thought it was more of a fancy cake, so I passed it up, waiting to make it another day. Had I spent a little more time to read the recipe instructions (and not just the recipe list), I would have quickly realized that this is not a fussy cake, and it doesn't take long to make at all. The most time consuming aspect of it is slicing and dicing the apples. Otherwise, it's pretty much like any other muffin or quick bread recipe that doesn't even require an electric mixer. I found that my cake took considerably longer to bake through completely - a full 20-25 minutes extra! I was worried that the edges would burn because they started to brown much sooner than the center, but in the end it was okay. The edges of my cake were a little drier than the center, but they weren't burnt at least. Otherwise, this recipe came together quickly and easily for me. The slightly chewy texture that the coconut gives this cake did not bother me, but I did read that a few did not like that. I love apples and I love coconut, but I never would have thought to put the two together like this. It was a nice combination of flavors. Thanks Amber, for hosting this week. I will definitely be making this again. If you would like the recipe, you can find it here. Make sure you check out the TWD Blogroll, to see how everyone else enjoyed this cake. - Make sure you test your cake before removing it from the oven - mine took a full 20-25 minutes longer to bake! 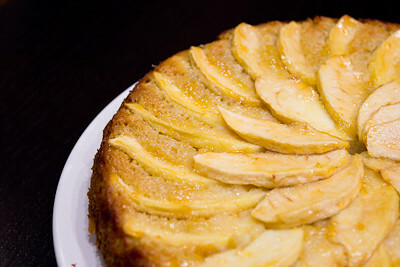 I just adore apple in a cake...At my house i'm the only one! 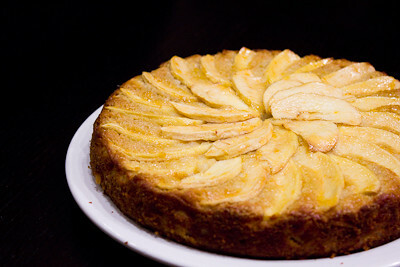 !So i don't make any cake with apple our i take the chance of having to eat it all alone... So ill take a piece of yours! Jaime! Your cake is STUNNING! Beautiful job!! Seriously, your photo should be a cover of Bon Apetit! Happy Holidays. i've never considered an apple-coconut combination either, but i'm thinking it'd be delightful. you did lovely work here, jaime! This sounds like the perfect way to use up the apples in my fridge. :) Your cake looks delicious! Coconut & apples isn't a flavor combo I would be drawn to but who knows. It certainly looks good. Apple and coconut sound like a great combination! I'm sure this cake was super tasty! Lovely cake! I have never tried apples and coconut together but Im sure they work beautifully, thanks!